Harry and Cathi Poole appear in my sidebar as contributors to this blog. Sadly Harry is no longer with us but his fine photography lives on and so does his contribution. I still remember how he chased me from pillar to post to get my blog right. He even had the temerity to disagree with my horticultural opinions! I hadn’t taken a photograph for forty years and he was particularly scathing over my pictorial efforts but he taught me a lot. He really cared. 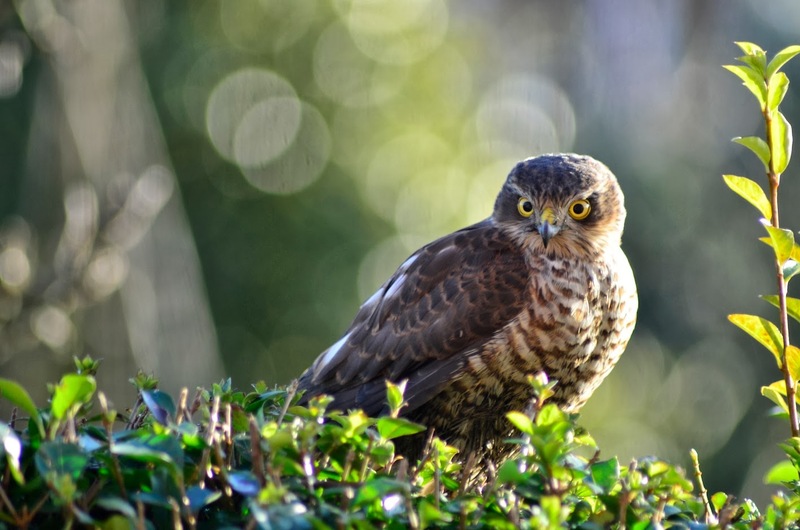 It was Harry who rescued the sparrow hawk trapped in my garage and bravely held the defiant disdainful creature for the camera whilst Brenda and I snapped away. We were very lucky with that one. Cathi still bursts out laughing when she looks from her bedroom and sees me holding a camera! The animals were a big part of Harry and Cathi’s life and it was a huge occasion when Harry hatched two eggs. Like all of their other animals the proud rhea parents had been rescued from an uncaring owner and had previously lived in a brown parched tiny field. Not only were the new babies born to a large green generous pasture they were actually raised in Harry and Cathi’s large garden. As they grew older I jested with Harry as he hosed copious white slime off his lawn. Cathi works in town and the burdens of parenthood fell to Harry. Male rheas normally incubate the eggs. On this occasion most of the raising fell to Harry. He was very busy that summer. Initially he would stroll around with the chicks in his breast pocket. He looked like an elevated kangaroo. It was a change from seeing him with a hen on his head! The tiny birds were soon the size of the chickens. 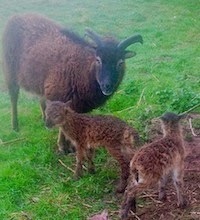 It was at least six months before they returned to join their natural parents in the field. Hedgehogs eat slugs, snails, insects and worms. They are not only insectivorous they also are omnivorous and will eat dog food, cheese, biscuits, currants and sultanas. Many but not all will hibernate in Winter. Do not give them milk and salty food. Replace meaty food every day. Ensure they can find a source of water. I wonder if they eat Christmas pudd? More likely a little finely chopped turkey. I suppose they might be asleep? Please someone tell me! There are hundreds of different mistletoes spread throughout every climate and continent other than Antarctica. They do not all look the same. What they all have in common is that they are all hemiparasites. Separately evolved in at least five distinct families of plants, they share an evergreen habit, sticky berries, photosynthesizing green leaves that manufacture sugars and haustoria that penetrate woody hosts to anchor themselves and extract nutrients. In the UK our native species is Viscum album, my subject today. Mistletoe is a parasite and one might assume that this is a bad thing. Not so. As a keystone species it brings rich ecological diversity to a wide range of habitats. 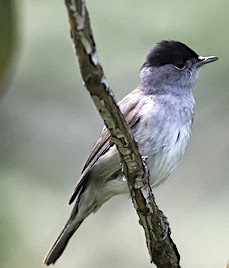 In the UK, mistletoe’s significant vectors are the mistlethrush and the blackcap. 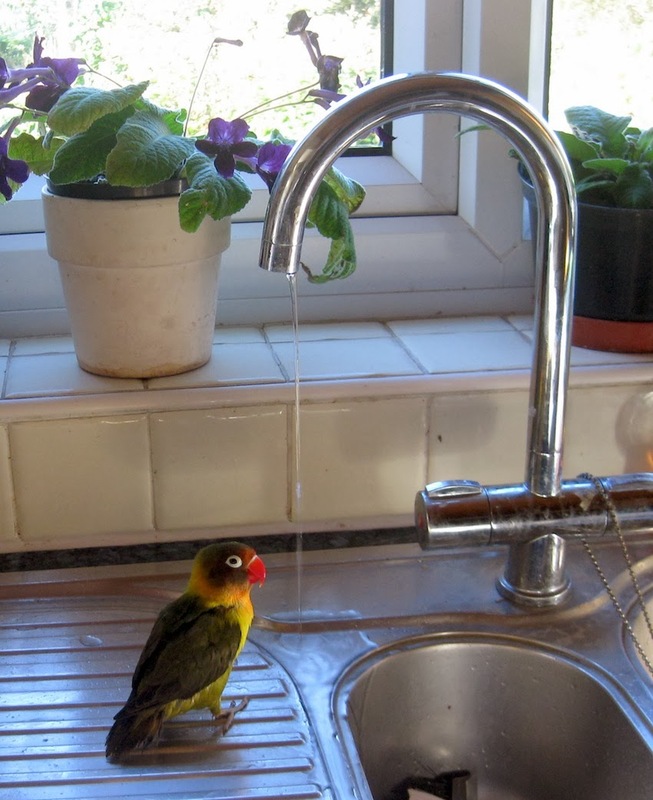 Very few other birds tackle the viscous berries. Both birds spread the sticky seed which adheres to tree bark, germinates and produces haustoria which penetrate the host’s internal tissues. Haustoria are its only source of nutrients, mistletoe has no roots. Neither the mistlethrush nor the blackcap requires mistletoe for survival but there would be very little mistletoe without these birds! 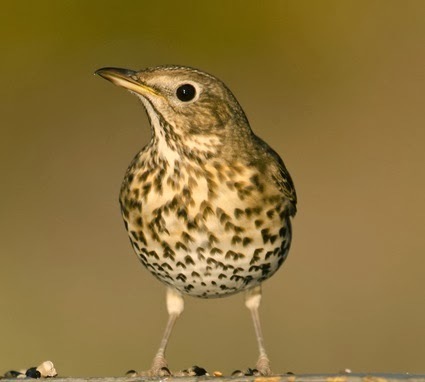 The mistlethrushes favourite foods are mistletoe, holly berries and juicy yew arils. They vigorously defend fruiting trees which they claim as their own! Berries are natures’s great invention to distribute seeds by enrolling animals and birds. 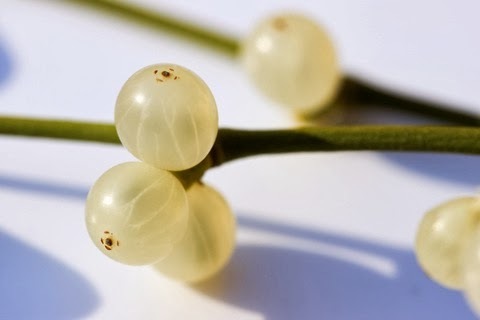 For many berried seeds - although not mistletoe - the process of digestion within a bird’s gut is integral to their eventual successful germination. It would appear that because of the diverse feeding habits of the mistlethrush its excretion is a rather ‘hit or miss’ process - literarily so - and seed might find itself on the wrong tree, or on no tree at all. The sticky viscin that coats mistletoe seed enhances the seed’s chances if it does reach its target. 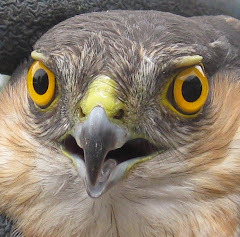 The bird’s latin name, Turdus viscivorus says it all. The Australian mistletoe bird does a much better job. Not only does the seed pass through its gut in as little as five minutes, it scrapes the sticky seed off its bottom with an inelegant shuffle. 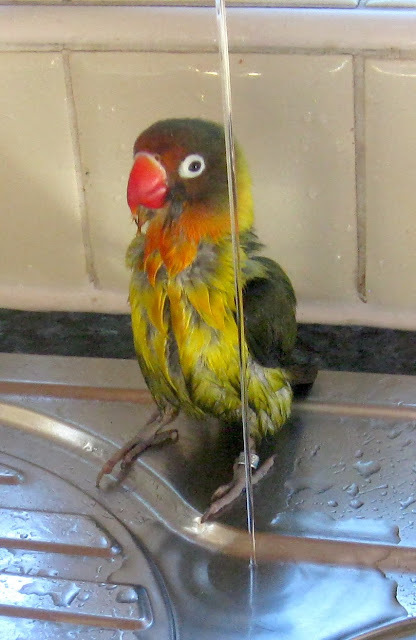 This links to a picture of this pretty bird. The blackcap is a game changer. 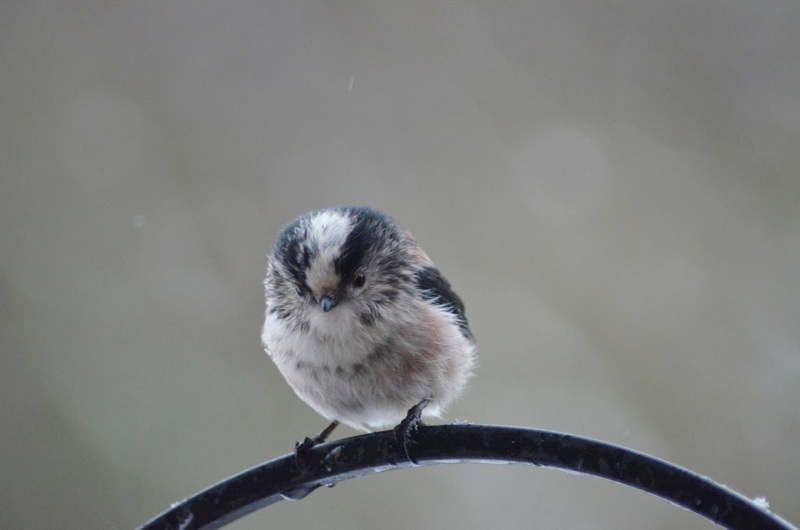 Since the nineteen eighties they have started to overwinter in England. A distinct genetic sub-race crosses from Germany. Spain’s loss has been our gain. The blackcap now resides here when the juicy white mistletoe berries ripen.The bird precisely ‘sows’ the mistletoe seed as it scrapes its beak clean. Mistletoes are not host specific, as is often stated, although not all tree species are able to act as a host. Blackcaps placing the seed are usually scraping the right tree! The gardener can pretend to be a bird and smear the seed on the bark of a suitable species such as apple, hawthorn and ash. Do not plant, just smear! 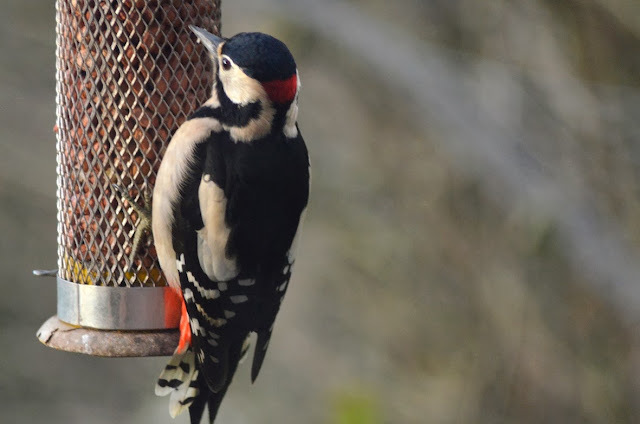 I love his black cap, his beak serves as the neb. The recent ancestral home of Viscum album is the South West Midlands down into Somerset. The apple orchards in Somerset and Worcestershire are traditional havens. Sadly these orchards are in decline. The good news is that blackcaps are dispersing the mistletoe and moving the centre of distributional gravity to Cambridgeshire and Essex and generally south east. Mistletoe no longer is in retreat and private gardens and suburban habitats are starting to take on the mantle. Good news, hot off the press, my friend Peter Williams has just returned from Cambridge where the mistletoe is profuse. He has sighted it on trees on the motorway embankments of South Yorkshire and growing strongly on poplars as far north as Goole. Mistletoe as a keystone species. Mistletoe may be the coup-de-grace to an ancient tree weighed down by this invader, shaded by mistletoe leaves and depleted of nutrients. However to the general ecology of a site, mistletoe is a complete boon. We old age pensioners need tender loving care and potions to preserve us from our geriatric aches and pains. It is the same with trees. Ivy - which is not a parasite, but a semi-epiphytic scrambling plant - will also hasten the death of an old tree for similar reasons. The important biological principle is that mistletoe and ivy just like my own agues, are all signs, but not the fundamental cause, of eventual demise. It’s called ‘old age’. Mistletoe makes it’s own sugars within its green leaves. It is incumbent on the leaves of a normal plant to constantly donate some of this nutrition back to the stems and the roots. In addition, deciduous trees at leaf-fall translocate break-down products back into the plant. Evergreen plants too withdraw resources before their leaves fall. No such responsibility falls on mistletoe and it is probably impossible for the haustoria to carry out this function. The consequence is that mistletoe leaves make very good fodder and support nectar rich flowers. Even better, when nutrient rich mistletoe leaves do fall to the ground, the deep litter provides the most magnificent resource for insects, invertebrates, small animals and birds. 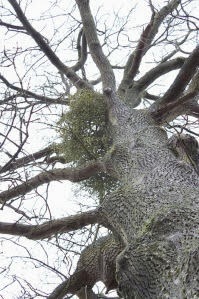 Although the dense crowded ‘witches brooms’ of mistletoe provides nesting, cover and nutrition for numerous species of birds, it is the leaf litter under the mistletoe that makes the greatest ecological impact. In an experiment reported in the New Scientist an area of land had it’s mistletoe pruned away and wild life was observed over a three year period. The ecological quality of the site was dramatically diminished and in particular animals and insect eating birds in the undercover below the trees were considerably depleted. 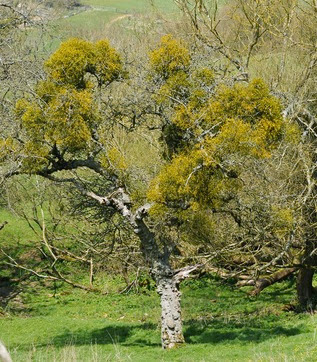 One significant factor is that within an area of wooded land there is considerable variation in the distribution and density of parasitic mistletoe. 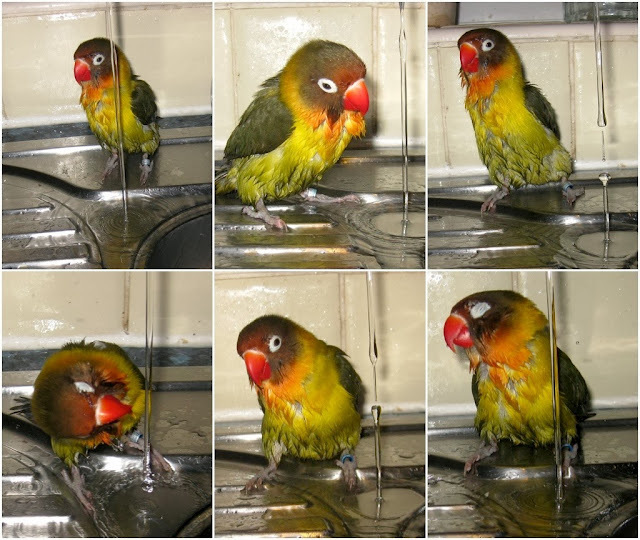 In effect there are ‘hotspots’ of distinct biological activity. Separate micro-sites where different combinations of plants and animals prosper are key to ecological abundance. No, not the whimsical Christmas stuff but the biological story. Everything I thought I knew about mistletoe is wrong. It is a harmful parasite. No its not, its an ecological desirable parasite. The seed needs to pass through the gut of a bird to germinate. Wrong. It is host specific. Seed needs to be transferred from apple to apple, poplar to poplar or ashes to ashes. No it does not. Seed needs to be pushed under the bark. No, it needs to be daubed. In my research for this post I came across Jonathan Briggs’ fascinating Mistletoe Blog, which I have brazenly plundered. In the link I give he has some very interesting things to say about one of our heroes. Jonathan has given me permission to copy some of his lovely pictures. 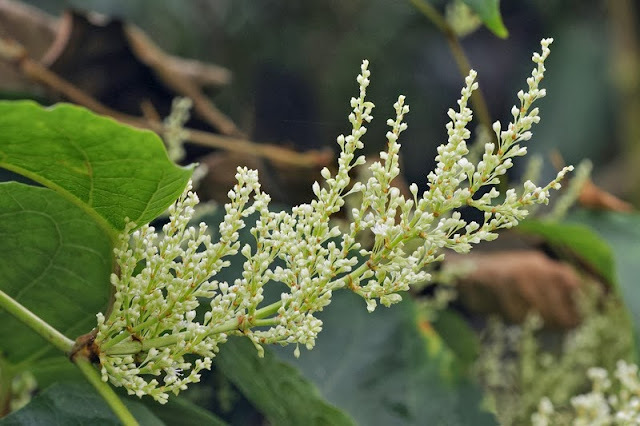 There is no doubt that Fallopia japonica - it used to be called polygonum - is a very serious weed. Its elimination can cost hundreds of thousands of pounds on a single building development. It is not difficult to control in the private garden, but you must not take your eye off the ball and it will take time. If you have the misfortune to possess a strong growing clump it will take at least three years to clear it using herbicides. Without herbicides it will be a complete nightmare, but with much persistence and a great deal of effort you can still achieve complete control. I do advise that you eliminate this plant. Although it is not unattractive and you might feel it not to be a problem, beware! You might find yourself with some very expensive provisions if it gets into your neighbour’s garden and, should you or your neighbour want to build an extension and planners become involved, well need I say more? It’s best to quietly get rid of it before it ever becomes an issue. Some people are now frightened that it can even affect the value of their own property. It will normally take at least three years to get rid of a strong clump of Japanese knotweed by spraying with glyphosate. It’s worth repeating what I have previously said about a principle that applies when eliminating difficult perennial weed - the actual work involved is quite small, it’s just that it is spread over a long period of time! In my own case, in Worsbrough cemetery garden, I eliminated a vigorous quarter acre stand of luxuriant ten foot high knotweed, but it took ten years. It took me two years to ‘break the back’ of the problem and I then lost focus. The area just became part of my less intensive spraying routine. I propose to describe my own methods and the very exciting recent success of Peter Williams in a garden in Derbyshire. It is however a pretty tough cookie. On volcanic slopes it grows close to fuming fumeroles. No wonder it can take over a garden or claim large tracts of riverbank and wet ground in the wild. It has a fantastic ability to smother and kill competing vegetation. This plant really is allelopathic and exudes plant killing toxins. The problem of Japanese knotweed has become worse where Fallopia japonica has hybridized with other vigorous knotweeds such as the Russian vine, Fallopia baldschuanica. This is rather similar to the problem I wrote about recently with the hybrid Rhododendron x super-ponticum. Sources as reputable as the Environment Agency will tell you that the weed can spread as much as a meter a month and grow more than 10cm per day. It is surprising how quickly plants grow under optimum conditions. Just google how far common creeping thistle will spread in a season! Yes, Japanese knotweed will spread very quickly in a wet month in August when there is no competition and yes, it will shoot up to ten foot high in very few weeks in June and July. Plants commonly grow rapidly in short vigorous bursts but then stop. Yes, it is a very real problem and has the ability to speedily spread, but I do find the propaganda hugely overstated. 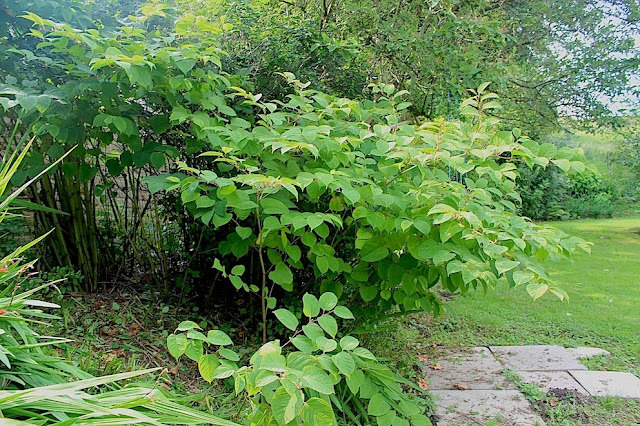 There is a rumour that it is illegal to plant Japanese knotweed in a garden. I wouldn’t recommend it, and it is definitely illegal to introduce it into the wild. It originally became a problem because it was introduced as a garden plant. A few years ago I visited a botanic garden (not one in God’s county) and admired their magnificent Polygonum japonica (as it was then called). The plant was confined by a lake on one side and a broad band of regularly mown turf on the other. Absolutely superb. My experience in Worsbrough cemetery. I explained in an earlier post how nearly twenty years ago, with the help of the naughty boys on probation who were doing community service, I eliminated more than acre of six foot high brambles in the wooded cemetery. Within the overgrown jungle was an irregular clearing of a quarter of an acre of very well established Japanese knotweed. The colony was bounded by a sturdy cemetery stone wall, trees and brambles. It was virtually impenetrable and grew as strongly as on any riverbank in Wales. I make one visit per month and in the first few years I had other ‘fish to fry’ and completely neglected the knotweed. It remained confined, I did nothing, but it did not spread much further. Eventually I got round to the fascinating horticultural challenge to kill it. I started on my project at the ideal time in late June when it had achieved maximum height and the leaves were still soft and receptive to my glyphosate. The literature does not confirm my opinion and says that translocation is more effective later in the season. I agree this is true of some translocated herbicides but not glyphosate. Japanese knotweed has a very limited season, not emerging until after severe Spring frosts and making no further growth after Autumn frost arrives. I would be able to spray about three times a year. As Is my wont when faced with difficult weeds on the first occasion of spraying I used my glyphosate at the maximum permitted concentration (and a little bit more) and gave them a drink in the morning and for good measure another later in the day. It was not possible on that day to reach all the weeds with my knapsack sprayer, even with its extended lance. I was aided in my efforts that the clump was irregular in shape and I could get in at the edges. I sprayed three times that season. The three sprays took in total, about six man-hours. I did the same in the following year. By the third year strong new growth had ceased and ‘bonsaied’ new growth was only about a foot high. As far as I was concerned, ‘job done’ and the site only received my normal maintenance spray. The knotweed did take another eight years to be completely eliminated but I am certain had I continued with my former intensity it would have been completely killed by the end of the third year. It is rather ironic that other than Keith Burkinshaw the cemetery sexton, hardly a single Birdwell resident knew that they had a Japanese knotweed problem in their locality. They were certainly unaware that I had solved the problem for them. Nobody noticed! St. Mary’s Church community pay me generous travel expenses for my monthly visit and pay for my glyphosate but the marginal cost to them of eliminating the weed was zero. That will be £50,000 sir! In contrast I received an anxious phone call from Bolton Percy church warden that someone had spotted knotweed in the cemetery and there was a bit of a local panic.The cemetery has never seen Japanese knotweed. The plants that had been spotted were completely harmless Polygonum persicaria that I planted. Application by injection is not a new principle. It worked very well for Peter this Autumn. The problem was that there were a few very healthy clumps of knotweed in someone’s garden. Some metres away there was to be a new building extension. There was not a cat’s chances in hell of the knotweed harming strong new building foundations. Unfortunately the plants reputation to penetrate badly laid or crumbling tarmac and its acknowledged ability to penetrate cracks made it wise to eliminate it. He drilled the base of each tough stem and injected a 10% glyphosate solution. This was at the beginning of September. The quantity of the weed was about twice that in the picture and it took him two hours. I asked him if the method would translate to larger plantations and he said no, it was too labour intensive, he would spray in such circumstances. One month later the top of the knotweed was dead and he cut it back to the ground. None of the surrounding ornamental plants suffered any damage what-so-ever. For practical purposes the knotweed was gone until next June! Now the question is will it come back? Almost certainly yes, and the knotweed must be allowed to grow a new top before it is re-treated, perhaps the then much weakened and smaller knotweed will be sprayed. I have no experience of Peter’s method. Wouldn’t it be wonderful if the Japanese knotweed has been killed outright. I doubt it, but I will keep you informed. Does digging out roots help? No digging was done at Worsbrough and I do not imagine Peter intends to dig either. The professional literature suggests that a combination of root removal and spraying is best. This might well be true but it is very important that you spray the undamaged intact weed first. Looks an interesting article and I assume you have some pictures of the foliage to show just what a beautiful plant it is. You might refer at slightly greater length to the timing of spraying or injection - The sources I looked up all stressed the need to spray late in the growing cycle when nutrients were being translocated back to the roots for overwinter storage. I used just a few ml of glyphosate per shoot and as you say nothing in the area was affected even the grass growing very near the clumps. Its distribution is also possibly worth a mention - whereas it is very widespread throughout Britain (as shown by the national 10x10km grid square data) it is only locally very common and usually in past industrial sites ( as shown by reduced presence in 2x2 km squares). Interestingly Edward Salisbury in the classic work on weeds in 1964 (2nd Ed) hardly mentions this plant but he does quote the RHS journal ‘The Garden’ for 1897 thus "A plant of sterling merit, now becoming quite common...and is undoubtedly one of the finest herbaceous plants in cultivation". He goes on to comment that that reputations can be lost and it can be seen on waste ground in London and once established "it is a labour to eliminate". It might also be worth mentioning the Cornwall County Council website that is helpful without being over dramatic and does I think, cover all the legal issues. predators. These were not introduced with the plant into the UK. of two years, or both. Thank you Peter You have given much food for thought. My mention that the hybrid between Japanese knotweed and the Russian vine might be a problem is probably nonsense. I have reported elsewhere that the best known hybrid is a complete wimp! There has not been a single sign of Peter’s injected Japanese knotweed returning and there has been zero damage to surrounding plants. I deliberately ‘miss spoke’ about his glyphosate concentration. Although he only injected a very few ml of the chemical it was actually almost neat 360g/l commercial product! My concentration of spray for my own spraying against Japanese knotweed in Worsbrough was 1 in 50, 360g/l concentrate/water. I mixed this by adding 200ml of 360g/l glyphosate concentrate to ten litre of water in my knapsack sprayer. A number of interesting topics have arisen in my comments section. Just press the comment button!